I was supposed to go for a bike ride with Ming today, but he messed up and had me take today off when he meant Friday. So I tried to make the best of a messed up situation and headed down to St. Peter to play board games with Klund as he he some time free. I went early and ate at the local breakfast joint, the Nicollet Cafe. Good basic breakfast (2 pancakes, 2 sausages, 2 strips of bacon, 2 eggs), but a bit 2 much food. I had some time left, so I went over to the River Rock for coffee, forgetting how I don't particularly like their Americano. Klund does a better job. 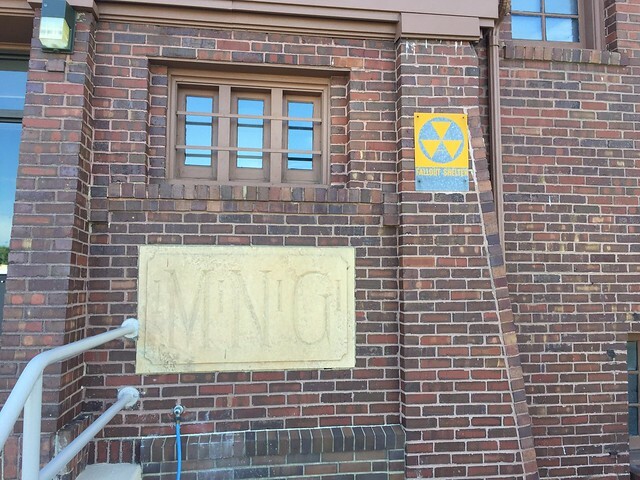 Before I point out the games, I thought this picture was particularly strange, because it seems to imply Ming has his own fallout shelter in St. Peter. Maybe he has them all over the country and I just haven't been paying enough attention. We played a slew of games. Several rounds of Klund's new game, Onitama. I saw it reviewed on one of the games for couples series on Actualol. It was as fun as it looks. Guyblin on Medium claims it's replaced chess for them. I think it would be a great work game and a great game as a gift for nieces and nephews. Fast, very fast. Here's the Actualol video it was in. Then we tried Kane Klenko's Covert. 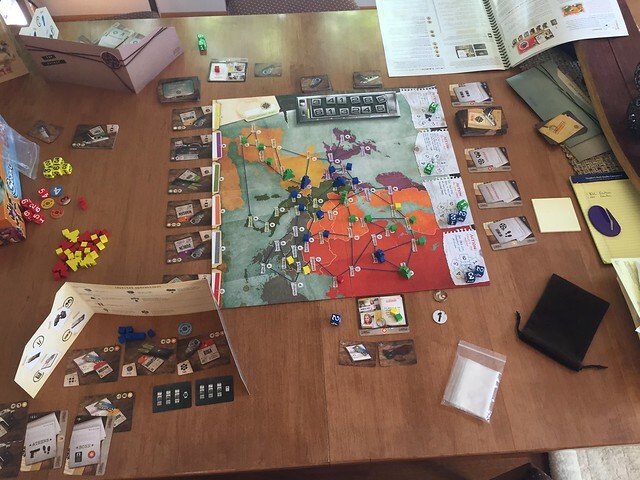 I've owned it for a while, but hadn't gotten around to playing it (there's a lot of those at the house). So we sussed it out. It's a bit like Pandemic. A bit like Ticket to Ride. And a bit of Klenko's dice placement. It took a little bit of time to get in the right frame of mind, but then it made sense. There are some interesting mechanics, like the code bar where you try to make the codes match the codes on cards you have in order to claim spy resources that are worth victory points or usable as means toward completing missions. 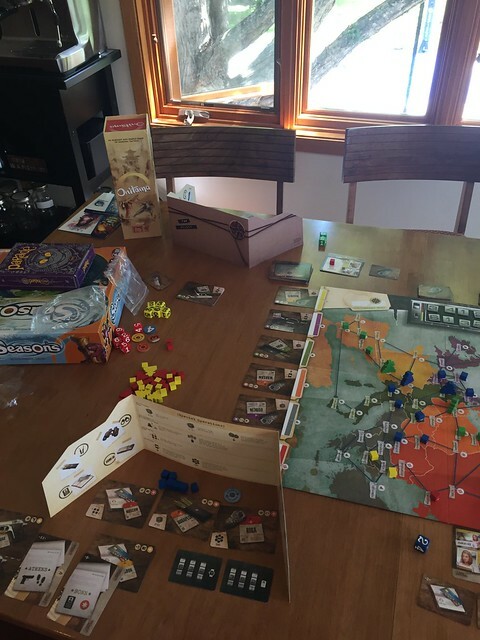 Very Pandemic feel to the board. 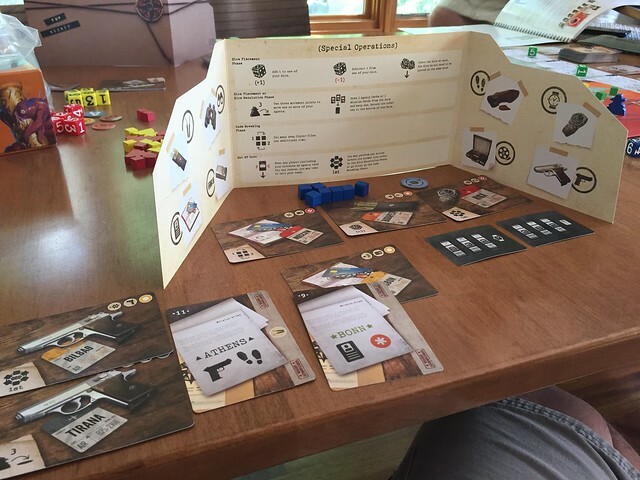 Missions to the right, "resource" type cards which double as special bonuses and flight cards to the left, and suitcase/codes at the top. Here's the view from behind my screen. It's the winner's view, I finished 7 missions (you need six to win, but there's a last chance to finish a mission). A lot of my success had to do with finishing a mission that gave me an extra set of lockpicks in all situations and capitalizing on grabbing a bunch of lockpick-based missions. It would have been more difficult with more people. Playing your dice to get cards and movement requires that you have a die that's sequential (up or down) with a previous die. That wasn't too hard with two of us. With a few more people it might get crowded and tricky. 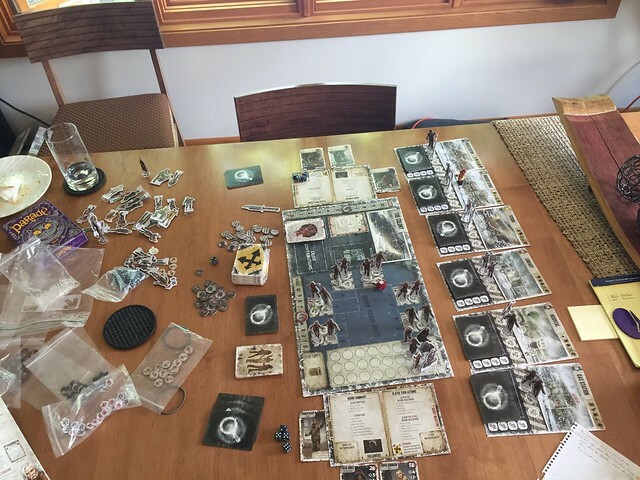 We followed Covert up with two rounds of Dead of Winter. Klund hadn't played it before and I think it's better with more than two people, but we played straight coop and used a hard mission on our second try. We won both times, partially because we got a lot of firepower without exposure in the right places. During our second game (collect medicine from remote locations) we actually managed to pull a card that removed all food in the school pile, meaning every single card drawn after that was a useful card. I almost wish we had done worse just to get a better feel for the game and what makes it fun (when things get stressful). We could see it looming with food shortages and waste accumulating, but just never got there. And we finished off the day with Seasons. A game I've had forever, courtesy of my sister reviewing my Amazon wish list, but haven't played because there are a number of things that predate me almost dying that suddenly became something I wouldn't do because they predate almost dying. Weird. Psychological. But true. The rules were hard to figure out using the printed rules and we had to resort to a mix of printed and online rules. But once we got going, it was straight forward. Roll dice, collect resources, the ability to play cards, and points, and use the cards to make points, sell resources for points, and get better cards, to score. In some ways, a bit like Magic the Gathering meets Dominion with a dice component. Klund thumped me. Absolutely crushed me. I'm not sure it's a game I'd play regularly, but I'd like to see it played with three or more to see how it changes, and it might be a good game to play with nieces and nephews. And, I should add, an absolutely beautiful day for a convertible ride to and from St. Peter, MN.